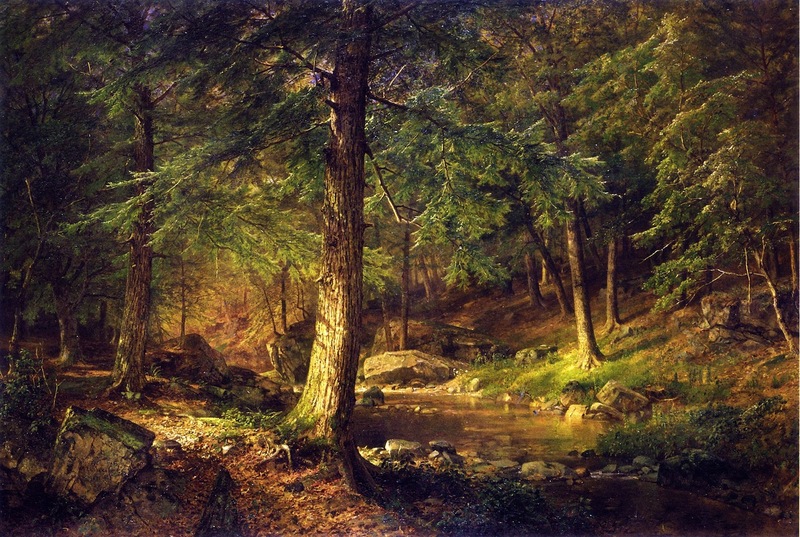 William Trost Richards (1833-1905) was an American landscape painter associated with the Hudson River School. Born in Philadelphia, he studied painting part time while working as a designer of ornamental metalwork. He had his first public show in Massachusetts in 1858. In 1862 he became a member of the National Academy of Design and in 1863 he joined an American Pre-Raphaelite group, Association of the Advance of Truth in Art. Richards had a different style than most Hudson River School painters, whose paintings were usually tinged with some amount of idealized stylization. Instead, Richards focused on purely factual renderings, and produced paintings that are highly realistic, even photorealistic from a distance. Nevertheless, despite this intense realism, several of his paintings also have an element of the fantastical. I believe this is because Richards finds magic in the truth of the natural world, without need for romantic embellishments. Early Summer is an example of this ability. The sun shines through the trees, and the entire forest seems to pulsate with the warmth of beauty of this light. With breeze-filled leaves and sturdy trunks, the trees populate the space with the power of their growth. The forest floor is covered in soft green grasses, while the tranquil pool reflects the wood around it. All of these elements are the reality of the forest Richards painted, but the enchanting character of the subject is palpable throughout this green and gold scene.